Delhi is a capital of India. There are several areas in Delhi which categorizes under rural areas and people are not much connected with the city. 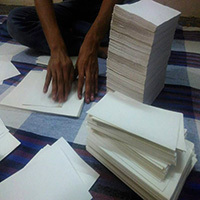 Najafgarh is a rural area in Delhi and our Artisan members working with us for Handmade Paper section in this area. 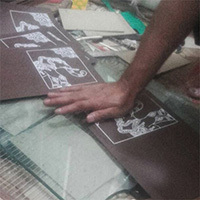 They recycle the paper and use it for making different products like Bag, Journals, Pen holder, Ornaments, Jewelry and other stationery items etc. We are trying to improve the living standard of our artisan community and focusing to improve their child’s education & health. 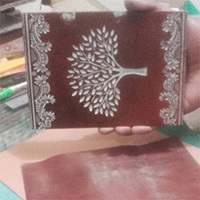 There is a group of 70 Artisan members in Master Piece Crafts Artisan Community and both Men & Women Artisans are working in their areas with responsibility and credibility. 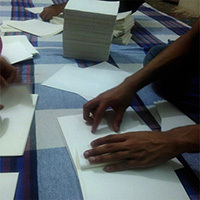 Our Artisans are making beautiful Journals and Gifts Packing Bags.